Why should I choose APA-trademarked plywood and OSB panels over imported panels? APA-trademarked plywood and OSB panels are manufactured to stringent product standards (such as Voluntary Product Standard, PS 1-09, Structural Plywood and Voluntary Product Standard, PS 2-10, Performance Standard for Wood-Based Structural-Use Panels) and are subject to APA's rigorous, state-of-the-art quality verification and testing programs. Many imported plywood and OSB panels do not undergo comparable product qualification testing. Without such tests it is impossible to determine how the panel will perform for the intended use. As an internationally accredited testing laboratory, APA put imported hardwood plywood panels from China and Brazil up against domestic plywood certified to the U.S. Product Standard PS 1. The import test results indicated inferior mechanical and connection properties, and severe failure for bond durability. Only one tested sample would have met the formaldehyde limits imposed by CARB. Look for wood structural panels bearing the APA trademark. It appears only on products manufactured by APA members committed to APA's rigorous program of quality inspection and testing. Learn more about the Performance Panels performance standards. Where do I find APA-trademarked products for crates, boxes, bins and other material handling applications? APA-member manufacturers are located throughout North America. Hundreds of distribution centers throughout the US and Canada inventory a wide selection of products for use in crates, boxes, bins and other material handling applications.. Industrial users can rely on a consistent source of readily available, quality products. 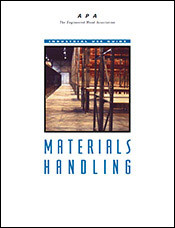 Find APA members that make products for materials handling applications. Which is stronger, plywood or OSB? In the applications for which they are manufactured, the two products are virtually interchangeable. Although different in composition and appearance, plywood and OSB are manufactured according to the same performance standard criteria. Which product you choose will depend on your requirements for a variety of characteristics including finished size, surface quality and panel density. Overlaid plywood panels are available with some type of face enhancement. Two common face coverings are a Medium Density Overlay (MDO) or High Density Overlay (HDO), which are resin-impregnated fiber surfaces bonded to one or both panel faces under heat and pressure. Other types of enhanced surfaces include fiberglass-reinforced plastic, polyethylene (HDPE), hardboard, metal and other materials for exceptionally smooth or special-use surfaces. The APA Product Guide: HDO/MDO Plywood, Form B360, describes HDO and MDO plywood applications, properties and characteristics, plus shop practice and finishing recommendations. Are custom sizes or panel configurations available? Yes, many APA member firms can make custom products for your unique applications. Find APA members that make custom products. What is the difference between “sanded” and “touch-sanded” panels? Sanded plywood panels are structural panels with face and back plies that are sanded smooth in the manufacturing process. Touch-sanded panels are plywood panels “sized” to uniform thickness by light surface sanding during manufacture. Sander skips are admissible. What is the difference between a “layer” and a “ply”? A ply is single veneer in a panel. In plywood, a layer consists of one or more adjacent plies having the wood grain in the same direction. For instance, four-ply panels always have three layers with both core plies at right angles to the faces. The two core plies are one layer and each face is a layer. In OSB panels, the reconstituted wood portion is one layer and each face is a layer. What is the difference between Structural I and Exposure 1? The term Structural I refers to certain specialized strength and stiffness characteristics of plywood and OSB panels. The term Exposure 1 refers to the glue bond durability of a plywood or OSB panel. What is the difference between Exterior and Exposure 1? Exterior panels are suitable for applications subject to long-term exposure to weather or moisture. Exposure 1 panels may be used for applications where construction delays may be expected prior to providing protection. Exposure 1 panels are made with the same exterior adhesives used in Exterior panels. However, because other compositional factors may affect bond performance, only Exterior panels should be used for long-term exposure to weather. Note: APA Rated Plywood Sheathing Exposure 1, commonly called “CDX” in the trade, is sometimes mistaken as an Exterior plywood panel and incorrectly used in applications for which it does not possess the required resistance to weather. “CDX” is manufactured with a C grade veneer on the face and a D grade veneer on the back. D grade veneers are not suitable for Exterior applications and should only be used for applications as outlined under Exposure 1 above. For sheathing grade panels that will be exposed long-term to weather, specify APA Rated Sheathing Exterior (C-C Exterior plywood under PS 1). For more information, please refer to Technical Topics: Bond Classification, Form TT-009, available as a free PDF from the APA Publications Library.